"The virtue of the print lies in the certainty that it comes from a creative process which permits no sham. Unlike brush painting, it permits no wavering of the hand. It is honest." Prior to the 20th century, printmaking in Japan had been largely relegated to the commercial process of ukiyo-e woodblocks in which an artist would work with carvers, printers, and publishers to create highly reproducible works of art glamorizing traditional subjects. With the arrival of the Mejii Period in 1868, Japanese artists became exposed to Western influences, spurring the sōsaku-hanga, or "creative prints,' art movement. Prints were transformed from cheap products made for the masses into original works of high art created by an artist that emphasized his or her individual voice and perspective while incorporating modern techniques and styles. Sōsaku-hanga's emergence was concurrent with Yōga, a painting movement also influenced by Western art ideals. The emergence of both, with their impetus toward creative self-expression, was responsible for establishing the new avant-garde in Japan. In contrast to its sister movement shin-hanga, which was an evolved contemporary form of ukiyo-e, sōsaku-hanga artists were solely involved in the printmaking process from design to finished project. They advocated that art should be self-drawn, self-carved, and self-printed. Although many sōsaku-hanga artists departed from historical Japanese art methods and materials through the introduction of perspective or by adopting from Western movements such as Folk Art, Naturalism, Expressionism, or Abstraction, they did so while still paying homage to decidedly Japanese subjects and traditions. Sōsaku-hanga's principles contributed to a new intellectual discussion of the "self" that was taking place in the Japanese cultural arena. Its artwork sat side by side with this new discourse in magazines and societies that grew during this time. With the rebirth of Japan after World War II, sōsaku-hanga became a strong part of the country's economic reconstruction as American patronage aimed to promote a more Democratic art. Much of the movement's prints at this time became more abstract and were viewed as an authentic blend of East and West. Sōsaku-hanga helped elevate the print from a work seen prior as a cheap advertising tool, or lowly form of artistic output for the commoner, to a valid medium for fine art. This elevation made a major contribution to today's proliferation of artist prints as credible forms of high art. In 1868, the onset of the Mejii Period in Japan brought about new open trade borders with the West, causing a countrywide rush toward modernity that affected all areas of society. Many Western teachers were imported to impart education in science and art in order to elevate Japan as an equal peer with the rest of the world. Many Japanese artists began to shake up what they viewed as the country's staid art traditions by adopting fresh styles and techniques from Western art movements and marrying them with aesthetics that were still decidedly Japanese toward creating a contemporary lexicon. 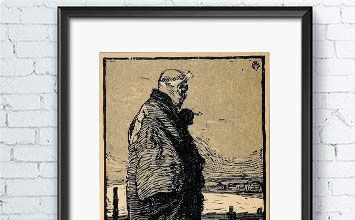 This groundbreaking print shows an aged fisherman, wearing a somewhat worn looking ceremonial robe, as he stands on an elevated spot overlooking the simple huts on the edge of the harbor. The fisherman is seen in profile with his face turned away from the viewer, contemplating the sea as he holds his pipe. The rough gouges of the wood carving create the swirling folds of his robe, the straw pilings on which he stands, the gritty worn feel of the village, and the sea framed by the dark lines of mountains or clouds on the horizon. Retaining the traces left by the chisel, the work is unmistakably modern, in its poignant and expressionistic feeling. Kanae was originally trained in wood and printing techniques before he began studying Yōga at the Tokyo University of Fine Arts, and this work combines both aspects of his training, as the innovative treatment of the block creates the shadow and depth of a Western-influenced naturalism. The gouges on the surface convey both the harshness and dignity of the fisherman's life. By eschewing the traditional collaborative process that had been previously established for woodblock prints, and lending the scene a sense of individual artistic expression, this piece launched sôsaku-hanga and also established the movement's divergence from the smoothly finished prints of ukiyo-e and shin-hanga. This print, depicting the deck of a boat in flat broad planes of orange and yellow with a blue speckled deck, focuses on the stylized figure of a woman, wearing a full length white robe, also flecked with blue, her back turned toward the viewer. The horizontal lines of the background contrast with her curvilinear form, emphasized by the black curve of her hair, and her left, unrealistically accentuated shoulder and arm. A subtle counterpoint of color is created by her orange sash, echoing the color of the lower horizontal band and the right edge of the railing, and by the variations in the blue and white pattern that pools on deck and surrounds her figure like ocean spray. This work with its color palette and stylized lines brought the influence of Post-Impressionism and Art Nouveau to sōsaku-hanga, while retaining the simplified elements and composition of a Japanese print. The artistic process of carving the woodblock is retained here, giving the work its spontaneous and modern feel, and distinguished sōsaku-hanga's approach from the finished surfaces of both shin-hanga and ukiyo-e. This print was groundbreaking in Japan, being the first abstract work, and that firmly connected the sōsaku-hanga movement to the modern avant-garde. This early print combined printing from both carved sides of the block in order to create the unfolding shape, which opens organically from overlying curves of red, outlined in flaring lines of white and red tones. The white shape draws the viewer's eye to the print's center, with its simultaneous organic and geometric vibrancy, highlighted by the four asymmetrical red crescents placed within it. Onchi's innovative printing process created a composition of multiple prints, overlaying one another, so that multiple perspectives were displayed in a single image. Rather than viewing printing as a reproduction technique to create multiple images of a single block, he focused on the single print as an image composed of multiple blocks or impressions. Even though he was to also create figurative works throughout his career, Onchi said in that abstract art was the "true sphere" of art, and that abstraction was not an imposition of Western influence but a return to the abstract in Japanese art from its ancient beginnings. This shin-hanga print depicts the Shiba Temple in Tokyo on a wintry day. It shows a single figure in the lower center, leaning forward into the blowing snow under a sheltering umbrella. The print focuses primarily on the red temple that fills and overflows the frame, creating a sense of monumental stillness. In contrast, the diagonals of the figure, the tree's trunk on the left, and the windblown snow, create a sense of movement. An evocative and paradoxical feeling of timelessness and the transitory nature of life are conveyed. This print with its traditional Japanese subject matter and its smoothly finished treatment exemplifies why shin-hanga was also dubbed, "the new ukiyo-e." The work was part of a series Twenty Views of Tokyo (1925), inspired by Hiroshige's One Hundred Famous Views of Edo (1856-1858). Yet Husui's approach is quite different, in both his emphasis upon a solo figure, suggesting the psychological isolation of modern life, and his close cropping of the temple, so that the building, in effect, becomes the landscape. Reflecting the Western influences that distinguished shin-hanga from ukiyo-e, the artist employs perspective, as seen in the vertical and horizontal structure of the building, and depth, as seen in the shadows beneath the overhanging roofs. The idealized and traditional subject matter, along with the work's polished finish, also sets the work apart from sōsaku-hanga. The work has the idealized, or romanticized feel of most shin-hanga work, creating what has been described, as a "unique and immediate appeal that rests upon traditional virtues of delicacy, poise and restraint." The most popular of the artist's print, this work was reprinted more than 3,000 times. This print, along with its production documentation, was designated an Intangible Cultural Treasure by the Japanese government in 1956. The novelist Jun'ichirô Tanizaki described Munkata as "an impertinent artist who gouges the universe," and his images have a sculptural power. This woodblock depicts Ānanda, Buddha's cousin and one of his ten disciples, known for his exceptional memory. The name Ānanda means "bliss," reflecting his joyful service to others and exceptional conduct, that spurred the Buddha to praise him for "the purity of his heart." In this image, the artist employed the sumizuri-e, or black ink only, technique to render the figure in bold outlines. The energetic lines convey a sense of spiritual energy, and the figure's outlined head, shoulders, and facial expression create an intensity of gaze, focused on an inner reality. This print reflects the mingei, or folk art, as well as the Zen Buddhism influences the artist brought to the sōsaku-hanga movement. In the series Ten Great Disciples of Buddha, from which this work is taken, Munakata depicted the ten primary disciples of the Buddha, by using magnolia woodblocks, a hard wood that required carving the figures with a vigorous energy. Munakata felt that the artist was a kind of medium for spiritual reality, and said, "My line must be executed in one quick and spontaneous stroke, as I do not believe in retouching. For the work to be fully animated, one's fresh and raw energy must be shown." To convey the power and expansiveness of the Buddha's message his figure fills up the frame, and the alternating black and white colors express the duality of Yin and Yang, which the figure unifies. Munakata said, "others treat black as black ink...to me it is life itself." The artist reprinted the series throughout his career, whenever he felt that the times called for the spiritual realities evoked by the figures. As art curator David Libertson said, "These prints spoke both to the fiercely modern nature of Munakata's work and the intertwined history of Buddhism and the woodblock print ... His work is ancient as it is modern. He recognizes a return to ritual, appreciating a power beyond himself that manifests in both his creative process and his completed works." This print depicting the ruined Buddhist temple known as the Usuki Site in Öita, Japan, focuses on the head of a Buddha, eyes closed in meditation. Behind the contemplative figure, several bodhisattvas and attending guardians can be seen, while the left lower third of the image is a black and white geometric pattern of broken stones. The diagonals, created by a broken fence-like structure in the center right and a large stone plane, convey a sense of contrast between the ruin of the site on the left and the serenity of the contemplative figures on the right, while the two muscular and fierce guardians in the center exert a protective presence. As a result, the image conveys a powerful sense of eternal calm persisting within temporal ruin. Hiratsuka's early training was in Yōga painting, but, influenced by Yamamoto Kanae and Hakutei Ishii, he turned to sōsaku-hanga prints and studied with the noted woodblock carver Bonkotsu Igami. As a result he was called "the most professionally trained carver of all the sōsaku-hanga artists." He would become a noted teacher particularly following the publication of his Hanga no giho (Print Techniques) in 1927. Hiratsuka's work was praised as sculptural, and his unique carving method was tsukibori, or poking strokes, seen in this print particularly in the treatment of the broken rocks. As he said, "This rough line came out of my search for greater strength and a feeling of solid mass." This technique and his subject matter of architectural sites and notable buildings were important contributions to sôsaku-hanga. While Hiratsuka worked in both color and black and white, he became most known for his black and white prints, his primary focus from World War II on. He said that black and white was the "zenith of picture printing," and spoke of it in musical terms, saying, "a black and white must have a rhythm of line and mass and a harmony of straight lines and curves. One of the great difficulties is to make the white space live..." Art historian Helen Merritt has written that his prints are "symbols of a unique symbiosis between the 20th-century art of Japan and that of the West." This print shows the poet Sakutarō Hagiwara, viewed in profile, the deep lines in his face and the intensity of his gaze conveying his personality, given to dark introspection. The broad area of flat color in the background sharply outlines his figure and also creates a sense of isolation, as if the poet inhabited his own inner world. Hagiwara has been called "the father of modern colloquial poetry in Japan," as he wrote free verse, disconnecting Japanese poetry from traditional form, to express the anguish and fears of modern existence. Onchi, who was also a noted illustrator, made the frontispiece and several abstract works for Howling at the Moon (1917), Hagiwara's first poetry collection that initiated his fame. The poet described himself as "a half unconscious automatic machine," and the portrait conveys his self-driven intensity. This portrait established sōsaku-hanga prints as equal in psychological expressiveness to painted modern portraits. As art historian Linda Ganus noted, "Here, the sensitivity of Onchi's draftsmanship and line is captured in the tendrils of the poet's hair and the refined subtlety of his pensive and melancholy gaze; it is remarkably painterly for a woodblock print, as well as a transcendently penetrating and nuanced portrait in any medium." This print became the most popular of Onchi's work, as it was much in demand with American collectors in the post-war era, resulting in numerous reprints. In general Onchi created only one or two prints of each of his blocks, and, even then, would sometimes change some element of the printing, in accordance with his view that each print was a singular work of art, and the printing part of the artistic process, not a mere means of reproduction. This later abstract print, depicts a number of singular forms overlaying each other: a black spiraling line, a yellowish-brown cloud-like wash, a vertical pillar, an intertwining serpentine line, and a black scribble. It utilizes a subtle but powerful sense of composition to convey the feeling of solitude. Some of the pictorial elements resemble natural forms; the vertical pillar combined with the wash of brown color atop may evoke a tree-like shape while the black spiral might conjure the Fibonacci sequence or a nautilus shell. Yet none of the elements are representational, and the associations they compel remain fluid, suggestive of shifting moods of feeling. The elements feel connected and yet the connection between them remains elusive. As art historian John Fiorillo wrote, "The composition is in flux, intentionally ambiguous, but the impressive control of the print medium and non-traditional print materials argue against chaos. The receptive viewer feels the resonant emotional power of such designs." This work was part of the artist's Lyric (1949-1951) series, one of many series he was to create referencing music. Onchi felt that what "the heart," or true feeling, could be best expressed artistically when form and color were used not as representational but equivalent to sounds in music. As a result, sōsaku-hanga artists were influenced not only by his abstract treatment, but also by Onchi's emphasis on feeling, as they engaged in their own explorations. This multiblock print shows the orange red imprints of a number of leaves on an irregular grid of varying grey and brown blocks, fit together like a puzzle. The work is abstract, drawing the viewer's attention to the process of creating the print, as the eye is drawn to the grain of the wood, the patterns created by the application of ink, and the veined, irregular, vivid shapes. The brightly pigmented leaf prints associatively evoke organic forms but elude representation. The background with its broad areas of flat color creates elemental geometric forms, and the pictorial space is flattened. This innovative use of objects as if they were woodblocks, created new artistic possibilities for sōsaku-hanga artists. In his Object (1953-1954) series, Onchi created abstract works using multiblocks, and also employing natural objects - leaves, cardboard, string, fish fins - to create an imprint. Following the difficulties of the World War II era in Japan, driven by an oppressive nationalism that valued only art used for propaganda, Onchi pursued abstraction and a sense of elemental form that he saw as intrinsically Japanese. As art historian Oliver Statler wrote, Onchi's "design, his color, his lyricism, all seem rooted deep in Japan ... Especially Japanese is his passion for fugitive beauty, for the beauty of transient materials, for the fleeting beauty of the moment already gone." This kappazuri, or stencil print, depicts four of the Twelve Heavenly Generals of Buddhism in a boldly graphic design, their figures created in a geometric pattern. The Heavenly Generals were protective deities, who accompanied the Bhaisajyaguru Buddha, of healing. Bristling with weapons, a bow and arrow, a sword, and staffs, their distinct forms present a unified and interlocking presence as they trample two figures representing illness and suffering underfoot. The fiercely stylized expressions of the figures on the far left and far right are seen in profile, suggesting vigilance. The figure in the center left captures the viewer's gaze with its intensity, its left foot on the head of a fallen enemy conveying a stance of power leaping out from the pictorial space. The overall effect is expressionistic, as the Ronin Gallery has noted, Mori's "art does not quietly wait for its viewer, it shouts out and strikes with awe." Mori's kappazuri was his primary innovation in the sōsaku-hanga movement, allowing him to make powerful designs, using simplified but charged patterns, as seen here in the curving lines that connect the figures together, contrasted with the verticals and diagonals that convey movement. He began his career as a textile designer, and that early training, along with the influence of mingei, the folk art movement, led him to emphasize bold patterns. In 1962 he was criticized by a leader of the group for having become more of an "artist than an artisan." In the following debate between art and craft, Mori left the mingei movement and focused exclusively on kappazuri works, like this one made the following year. His subject matter, here derived from Buddhist lore, led to his being dubbed the "Child of Edo," for his ability to combine graphic contemporaneity with traditional subjects of the Edo period.